ZUOZ is Automature’s extensible atom library, organized by application domain. Zuoz atom implementations have been done using Java and Ruby. Java atoms form the larger portion of the library, and they have been implemented to run in the same process context as Zug, so they run fast. Zuoz atom libraries act like a convenient plug-ins that enhance Zug's platform independent architecture providing domain specific functionality. ZUOZ atoms interact with ZUG through a simple and well-defined interface. Additionally, ZUG also supports an array of built-in atoms. If our atoms prove inadequate or restrictive, you can add your own atoms to this library, implemented in the language of your choice, for the domain of your needs. The rich atom library supports testing of Web Applications using Internet Explorer, on Windows, Firefox, Chrome and headless browser testing on both Windows as well as Linux. 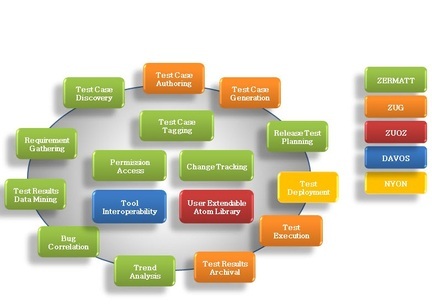 All Zuoz atoms are threadsafe, and allows complex testcases using multiple browsers to run simultaneously. With ZGUI atoms you can automate tests based on the recognition of an image. This feature is specially useful when the elements on a window are not available as text but purely as images. Zuoz atoms are great for writing test cases for REST APIs too! Zuoz also provides support for DB access, email retrieval or sending, and generating complex patterns of random data.